This is your dream come true, if you are planning a destination wedding! Want all your decor in one full swoop? Simply order this package deal, and all the details will be taken care of so you can simpy put in a suitcase, and head out for your vacation! 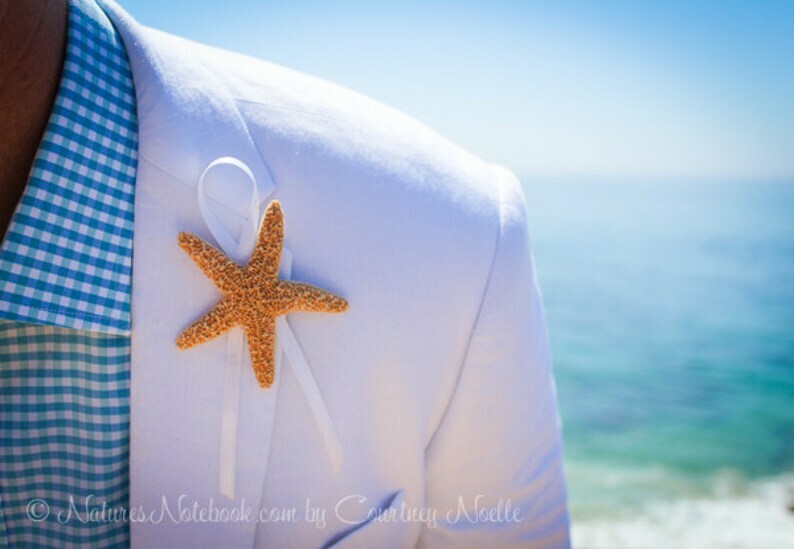 - 14 Super Starfish Boutonnieres for your guests, with Ribbon Color of your choice. - 14 Starfish Bouquet Charms that will double as favors for your wedding party. - 1 Flower Girl Basket with Matching Ribbons, and Matching Starfish. - 1 Ring Bearer Seashell that will hold your rings, with matching the ribbon. - 1 Guest Book, your names were written in the sand with blanket pages inside for your guests to sign.